After breakfast we boarded the RC Tornado to Vienna. That’s what the team called our flight (Bus) today. They went through the motions as if we were boarding a flight including a very funny safety demonstration. Once we got into Vienna the pilot drove us around the ring road of Vienna so we could see some of the sights mentioned in yesterdays “Virtual Vienna” and then we all went in our own groups of friends for the day to do what we liked armed with maps, a travel pass and contact numbers of the team. After a whole day in the capital we met up again at 15.45 for our flash mob. We spread on Stephansplatz and did the great fall, where we remained still for 2 minutes lying on the floor with sheets of paper telling interesting facts about war. It was hard not to laugh or move for two minutes, but we definitely made an impact on the tourists in the area who came over to see what it was all about. 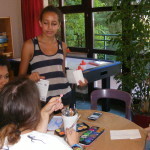 After returning to Langenlois, we prepared a speech and worked in creative ways on the topic peace. 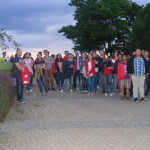 After reading out our speech to the whole camp and friends who came to join us, we then walked through the town centre to Spitzpark where we had a bonfire. 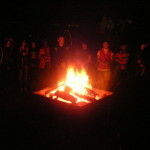 We finished up at the campfire where we sang songs with the team playing guitars to share the light, we all lightened our torches on the way back to the camp. It was a very relaxing night.